In case of 'orderN.Exact.Inverse.S=on', the inverse of overlap matrix for each truncated cluster is exactly evaluated. Otherwise, see the next keyword 'orderN.KrylovS.order'. In case of 'orderN.Exact.Inverse.S=off', the inverse is approximated by a Krylov subspace method for the inverse, where the dimension of the Krylov subspace of overlap matrix in each truncated cluster is given by the keyword 'orderN.KrylovS.order'. In case of 'orderN.Recalc.Buffer=on', the buffer matrix is recalculated at every SCF step. Otherwise, the buffer matrix is calculated at the first SCF step, and fixed at the subsequent SCF steps. In case of 'orderN.Expand.Core=on', the core region is defined by atoms within a sphere with radius of , where is the distance between the central atom and the nearest atom. The core region defines a set of vectors used for the first step in the generation of the Krylov subspace for each truncated cluster. In case of 'orderN.Expand.Core=off', the central atom is considered as the core region. The default is 'on'. It is better to switch on 'orderN.Exact.Inverse.S' and 'orderN.Expand.Core' as the covalency increases, while the opposite could becomes better in simple metallic systems. In Fig. 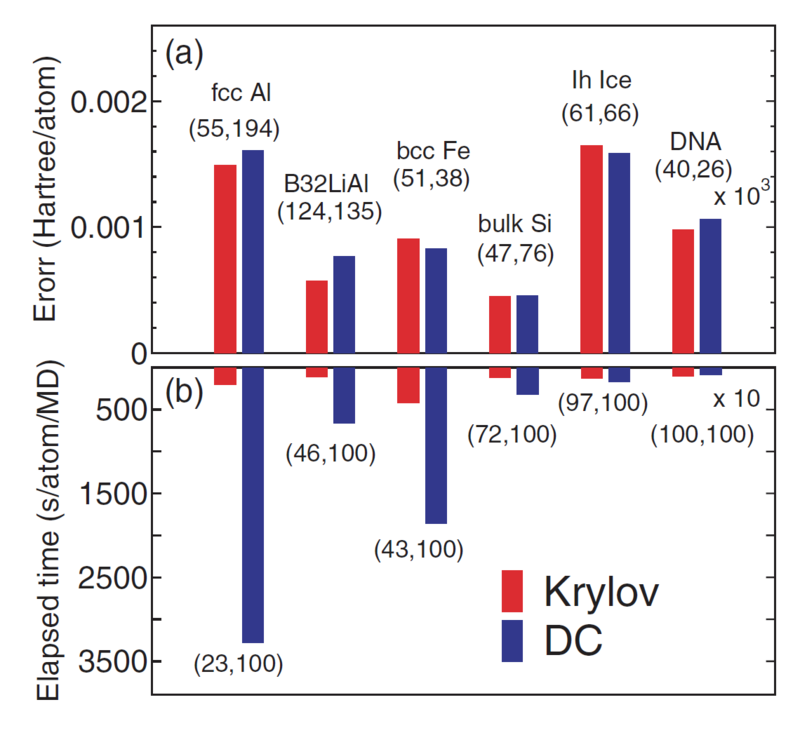 19 the absolute error in the total energy calculated by the Krylov and DC methods are shown for a wide variety of materials. It is found that in comparison with the DC method, the Krylov subspace method is more efficient especially for metallic systems, and that the efficiency become comparable as the covalency and ionicity in the electronic structure increase. It is also noted that the O( ) Krylov subspace method is well parallelized to realize large-scale calculations. The most efficient parallelization for the O( ) Krylov subspace method can be realized by using the same number of MPI processes as that of atoms together with OpenMP threads. Figure 20 shows that a system consisting of a hundred thousand atoms can be treated on a massively parallel computer [33,34], where the diamond structure consisting of 131072 carbon atoms is considered as a benchmark system. Figure 19: (a) absolute error, with respect to the band calculations, in the total energy (Hartree/atom) calculated by the Krylov subspace and DC methods for metals and finite gap systems, (b) computational time (s/atom/MD). For a substantial comparison, the calculations were performed using a single Xeon processor. The set of numbers in the parenthesis of (a) means the average number of atoms in the core and buffer regions. The set of numbers in the parenthesis of (b) means the percentage of the dimension of the subspaces relative to the total number of basis functions in the truncated cluster, respectively. 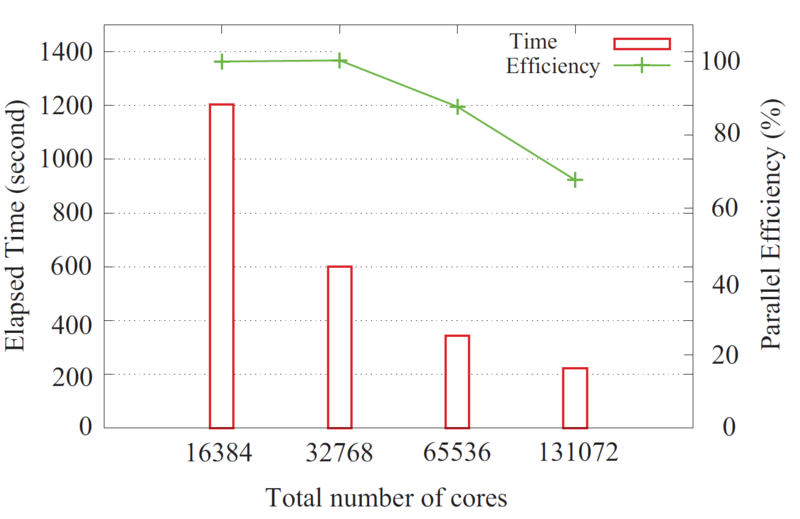 Figure 20: Parallel efficiency of the O( ) Krylov subspace method in the hybrid parallelization on the K-computer, where eight threads were used for all the cases. The diamond structure consisting of 131072 carbon atoms was considered as a benchmark system.